Jesus or Squirrel? : Jesus Heals. So does the Black Nazarene? 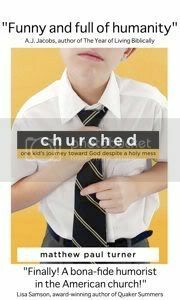 For a short time in 1987 I lived down the street from the famous Quiapo Church in Manila. This is an ominous building that towers over a section of the city known for its poverty and crime. 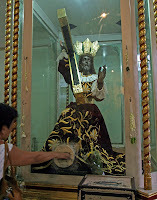 One reason this Catholic Church is well known is for its 400 year old statue of the Black Nazarene, a life-sized, dark wood sculpture of Jesus carrying his cross, brought to the Philippines from Mexico after being carved from an unknown Aztec carpenter. The statue has become a Philippine national symbol of surviving turmoil and pain. Although the church building itself has been destroyed twice by major fires in 1791 and 1929 and barely survived the bombing of Manila from the Japanese in World War II, the statue has remained unharmed. This has evolved into the idea that the wooden image is blessed by God and is instilled with healing powers for itself and others. This has become a spectacle at both the local and national level. At the end of every Mass the church congregation proceeds alongside the statue clapping their hands in praise. 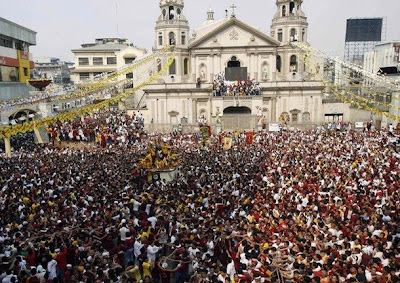 Then once a year, on January 9, the idol has its own parade through a section of Manila with people pressing in to touch the statue, hopefully to receive healing. This year over 2.5 millions people lined the three miles of the parade route, with the statue taking 13 hours slowly rolling by on its carriage. Although the desired result is healing the parade has become rather dangerous. This year there were over 220 injuries resulting from the pressing crowds including many fistfights and lost children. In 1998 a member of the Iglesia ni Cristo church (a major church denomination in the PI) shot the statue in the head. Now the original head and cross remain in the church with replicas placed on the 400 year old wooden body during the parade. I could find no news reports of people receiving miracles this year. How do we score this one? If it was merely a matter of judging whether or not the statue has Jesus’ miracle powers I’d vote no and give the point to the Squirrel. I’m also tempted to chalk it up to tradition as it is such a symbol of national pride. But before the final ruling I want to point out that I’m rather disappointed in the Catholic bishops. Instead of shepherding their flock with truth they have made a practice of selling raffle tickets (21st century indulgences?) with the winner getting a face-to-face meeting with the Pope in Rome. Yes the Filipino priests deserve some blame for this one. Still, I’ll the put the majority of the blame on the people themselves and mark this one down as superstition.